Liz is an independent professional modern dancer, aerial artist, choreographer, and certified Stott Pilates instructor who began ignoring gravity as a child by jumping on the bed, swinging off the monkey bars at school, and training in gymnastics for many years. A graduate of the Senior Professional Program of Contemporary Dancers in Winnipeg, Liz fell in love with dancing in the air at the Aerial Dance Festival in Boulder, Colorado, and helped create the Aerial Dance Program at Monica's Danz Gym in 2001. This program is the first and only one in Manitoba to offer training for all levels and ages in Aerial Fabric, Hoop, Static Trapeze, Aerial Hammock, Straps, and Harness. Liz has also received additional aerial training in Toronto, at Circus Juventas in Minneapolis, and with renowned instructors at the Aerial Dance Festival in 2006 and 2008. 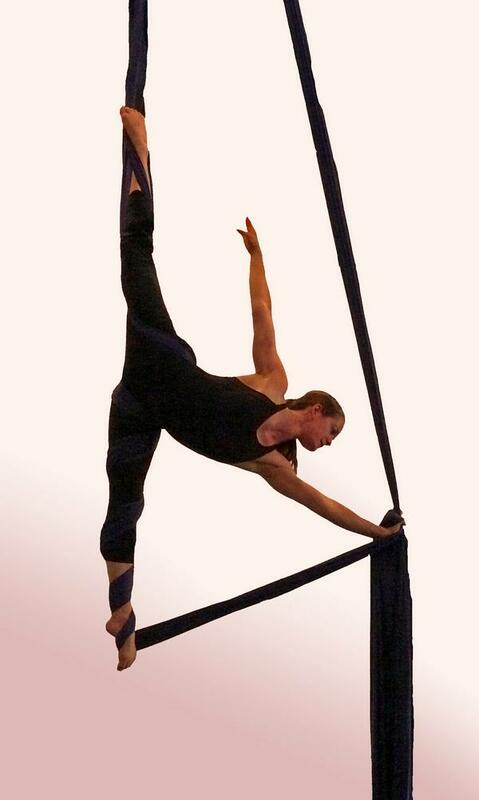 In addition to teaching ongoing classes with Monica's Danz Gym, Liz has also taught aerial dance workshops in Saskatoon, Hawaii, and with the Oulun Tahti Sirkus in Finland. As a soloist and as a member of MOMENTUM, Liz has performed aerial choreography in many venues both locally and internationally. Highlights include the World Gymnaestrada in Portugal in 2003 and in Austria in 2007, the Canadian Gymnaestrada in Ottawa in 2006, the Reception for the Grand Opening of Winnipeg's new MTS Centre Arena, the gala banquet for the Juno Awards in 2005, the Nygard for Life Pink & White Ball, Winnipeg's Mardi Gras, the Dare to Dance Gala in Saskatoon in 2006, the School of Contemporary Dancers Professional Program's 35th Anniversary Gala in 2007, and Canada Day celebrations with the Winnipeg Symphony Orchestra in 2009.